[Picture inset L to R: Convicted double murderer Leo Johnson, Nicky Packard and Michael Sewell. 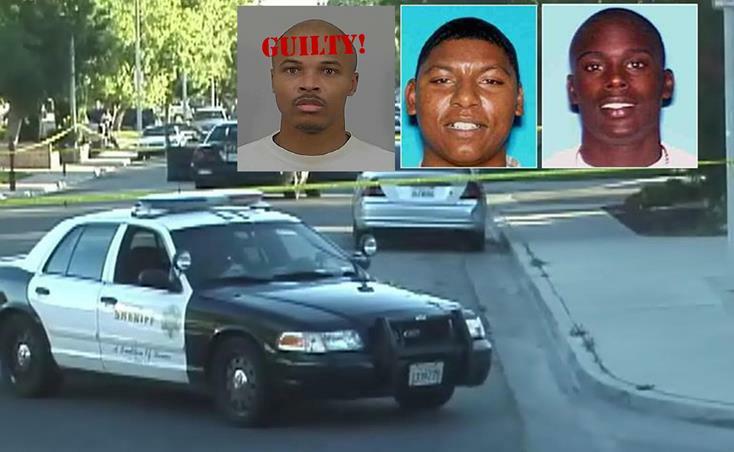 LOS ANGELES – A state appeals court panel upheld a parolee’s conviction for the murders of two men at a house party in Lancaster nearly 5 1/2 years ago. But the three-justice panel sent the case against Leo Jerome Johnson back to the trial court Monday as the result of a new state law that gives judges discretion to strike certain firearm enhancements. Johnson was sentenced in January 2017 to 80 years to life in state prison after being convicted of second-degree murder for the June 23, 2013, shooting deaths of 33-year-old Nicky Packard and 22-year-old Michael Sewell Jr.
Johnson was on parole for armed robbery at the time of the crimes. Prosecutors said the victims were at a party throw by a motorcycle club and then went to an after-party at a house on Hanstead Avenue, where they approached Johnson using language from a rival gang. Family members told authorities the men didn’t belong to any gang, but had ties to that world. Johnson went back to his house, got a gun and confronted the victims as the after-party was ending, shooting Packard three times and Sewell once as he tried to come to Packard’s defense, according to prosecutors. Prosecutors contended that Johnson was a gang member, but a gang enhancement was dismissed by the court before the case went to trial. 7 comments for "Man’s conviction upheld in Lancaster double-murder"
You have 5 kids with a 22 year old? What kind of job did he have that took care of a 5 kids at 22? Please don’t act like all these players were saints. they weren’t. People need to realize when you play the game there are winners and losers. if you play the game long enough you will loose. NOBODY IS UNDEFEATED. Job ? Please they don’t work they are free loaders . Everyone else has to work to raise their kids. Sick of them all.. The other two died, idiot. At least Johnson won’t have a chance to kill anyone else on the street anytime soon. This article is poorly written and contains several inaccuracies. If the gang enhancement got dismissed by the court why would you report that Nicky Packard approached the shooter using language from a rival gang? Also, to report that Nicky Packard had “ties to that world” sets a tone with the reader that he was affiliated with a gang. Have you taken the time to pull his record to see his only ever offense while living was a DUI? No gang affiliations period! If a person knew people from high school that are gang members does that mean we all have “ties to that world”? Nicky Packard was a hardworking, talented, funny, family oriented, phenomenal Father of two sons and his life was taken from him. The shooter deserves to stay in jail away from his family FOR LIFE!